Gujarat, a state which is remarkable in the Indian history has many more vibrant features and diversities. It has a significant contribution to the cultural heritage of India. The place is famous and valuable for art, architecture, culture, and heritage. 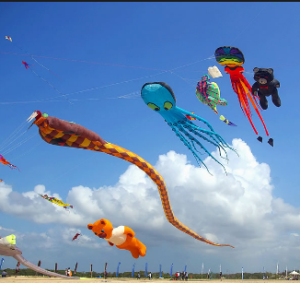 The Kite festival is also known as Uttarayan which is a uniquely Gujarati phenomenon, where the skies will be filled beautifully with the kites all over the state of Gujarat from before dawn until it turns into darkness i.e. the evening time. The festival is much awaited and fills with loads of fun and excitement. The day falls in the day of makarsankranti when the winter begins to turn into summer, as per the Indian calendar.The day of festivity and togetherness is considered as one of the major harvest day in India. The festival is the signal that the sun is back and the awaited harvest season has arrived for the major source of strength i.e. our farmers, the time is called and celebrated as makarsankranti. People wait for this special eagerly and the preparation starts from early morning as the day considered as sacred and holy festival. Various delectable Gujarati dishes and sweets like ladoo, undhyu or suratijamun which are prepared for special occassions and eaten on this day. Most of the children and male adults hop on to their rooftops to fly the kites and take advantage of the favorable morning breeze. People in small small groups accompanied along with their friends family, neighbours and the roof tops and terrace of the houses will be filled by people to find the space for kite flying which can be considered as the symbol of togetherness. The International kite festival is known as one of the main and biggest festivals celebrated in our nation. The homes in Gujarat will start to make kites for this sake, months before the festival arrives.Different types of kite vary in shape and sizes are flown and there will be a competition and it is to battle with the nearby kite flyers cut their strings and bring down their kites.There will be stalls which sales kite specially a stall named Pathang bazaar the special kite market that appears in the old city. The festival is a fun filled and the beautiful scenery of sky which is filled with kites and a celebration to remember and cherish forever.